snowdeal.org > ex machina: the eric update - day 1249: on throwaway thanksgiving photos and wrong conclusions. the eric update - day 1249: on throwaway thanksgiving photos and wrong conclusions. it's thanksgiving. the homemade pies have been baked. the 25 pound turkey from the local amish farmer is cooking. friends are about set to arrive. 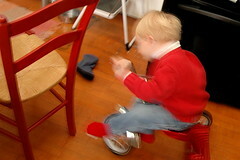 i take a throwaway shot of odin tearing around on his tricycle to see if i need to adjust any settings to capture the days festivities and i notice that something is amiss. even though the flash was firing, the camera wasn't compensating and anything that moved was blurry. so, none of the photos with anything moving came out. i suppose it says something about my personality and some will not find it the least bit surprising when i admit that in one fell swoop of reasoning, i surmised that the sb 600 flash ( onboard flash long ago stopped firing ) was broken and needed to be taken apart. a word of advice if this happens to you, don't try to take apart your sb-600. i believe it's engineered to make it supremely difficult to put back together, and you really should just check to make sure you didn't accidentally put your camera in "rear curtain" mode instead.